Audrey Ann Faxon, 83, Beatrice died Monday, September 03, 2018 at Beatrice Health and Rehab. She was born May 26, 1935 in Beatrice to Claude and Margaret (Stevens) Bartlett. She grew up in the Beatrice area. Audrey married John E. Faxon on May 29, 1955 at the Ellis United Methodist Church, they moved to the Odell area, before moving back to Beatrice/Ellis area in 1998. She graduated from Beatrice High School in 1952, attended Nebraska Wesleyan and graduated from the University of Nebraska in Lincoln in 1972. 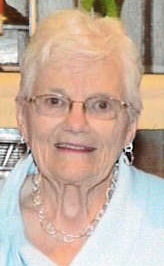 Audrey taught school in Beatrice, Steele City, Barneston and retired from Lewiston Consolidated Schools after 31 total years of teaching. She was a member of Ellis United Methodist Church, United Methodist Women (past secretary, president, and treasurer), Pastor Parrish committee chairman, other various church committees and was church organist at Odell and Ellis. Audrey was a member of 4-H, Lewiston Education Assoc., NSEA, NEA, and past officer of Beatrice Area Retired Teachers Association. Survivors include her husband, John E.; children, Sarah McMahon of Salina, KS, Dianne Faxon of Lincoln, NE, John W. Faxon and wife Teresa of Odell, NE, Margaret Schotte and husband Steve of Marysville, KS, Steven Faxon and wife Janet of Beatrice, NE, Sheila Bargman and husband John of Beatrice, NE, Edward Faxon of Lincoln, NE, Thomas Faxon of Odell, NE, Amy Morgan and husband Jon of Elkhorn, NE, grandchildren, Samantha McMahon of Manhattan, KS, Lindsay Mares and husband Carlos of Salina, KS, Kailey McMahon of Salina, KS, Crystal Brincks and husband Jason of Honey Creek, IA, Melissa Friedrichs and husband Ryan of Marysville, KS, J.D. Faxon of Grand Island, NE; Austin Schotte of Marysville, KS, Zach Schotte of Marysville, KS, Maggie Schotte of Marysville, KS, Derek Faxon of Nebraska City, NE, Jill Faxon of North Platte, NE, Hannah Bargman of Nashville, TN, Meredith Bargman of Los Angeles, CA, Turner Faxon of Odell, NE, Beau Morgan of Elkhorn, NE, and Jaxon Morgan of Elkhorn, NE; great-grandchildren, Rebecca and Isaac Mares of Salina, KS and Korie and Case Friedrichs of Marysville, KS. Audrey was preceded in death by her parents; sisters, Shirley Mae Bartlett, and Beverly Jean Finch; son-in-law Robert McMahon; parents-in-law, Egbert and Blanche (Shalla) Faxon. Funeral Services will be held 2:00 p.m., Thursday, September 6, 2018 at Harman-Wright Mortuary Chapel, Beatrice with Pastor Hollis Patterson officiating. Burial will be in the Evergreen Home Cemetery, Beatrice. A family prayer service will be held 1:45 p.m., Thursday at the mortuary. Visitation will be from 9:00 a.m. to 8:00 p.m. Wednesday at the mortuary, and one hour preceding the services. A memorial is established to the family’s choice with the mortuary in charge. A guestbook is available online at www.harmanwrightmortuary.com Harman- Wright Mortuary in charge of arrangements.